5/7 E. Jimmie Leeds Rd, Meadowridge Rd., S Second Ave.
Mark J. Voughit, 49, of Gallowaywas arrested on May 5 by Ofc. Robert Bauer for DWI. Mandee M. Beasang, 23, of Galloway was arrested on May 7 by Ofc. Patrick Neal for possession of less than 50 grams of marijuana. Alan W. Bassett II, 32, of Galloway was arrested on May 7 by Ofc. Kevin Jorgensen for burglary and theft. Christopher Littleford, 43, of Port Republic, was arrested on May 7 by Ofc. John Mooney for DWI, following a single vehicle accident. Arby M. Williams, II, 35, of Pleasantville, was arrested on May 9 by Ofc. Scott Winnebergr for possession of CDS. 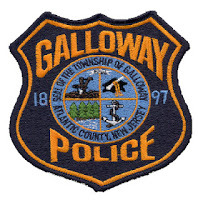 Hailey G. Jones, 18, of Galloway was arrested on May 9 by Ofc. Ronald Gorneau for possession of less than 50 grams of marijuana. David L. Hood, 41, of Galloway was arrested on May 9 by Ofc. Ronald Gorneau for driving while suspended after DWI. Joshua Henderson Cole T. Byron, both 18, of Egg Harbor Twp. were arrested May 11th by Det. Jason Kiamos for possession of marijuana under 50 grams. Byron was also charged with possession of oxycodone and possession of marijuana with intent to distribute.